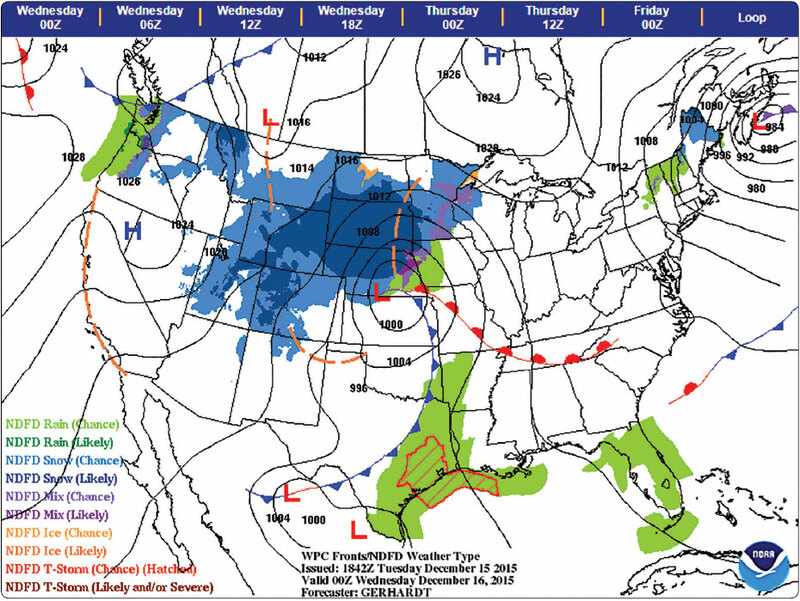 Weather charts are graphic charts that depict current or forecast weather. They provide an overall picture of the United States and should be used in the beginning stages of flight planning. Typically, weather charts show the movement of major weather systems and fronts. Surface analysis, weather depiction, and significant weather prognostic charts are sources of current weather information. Significant weather prognostic charts provide an overall forecast weather picture. Sky cover—the station model depicts total sky cover and is shown as clear, scattered, broken, overcast, or obscured/partially obscured. Sea level pressure—given in three digits to the nearest tenth of a millibar (mb). For 1,000 mbs or greater, prefix a 10 to the three digits. For less than 1,000 mbs, prefix a 9 to the three digits. Pressure change/tendency—pressure change in tenths of mb over the past 3 hours. This is depicted directly below the sea level pressure. Dew point—given in degrees Fahrenheit. Present weather—over 100 different standard weather symbols are used to describe the current weather. Wind—true direction of wind is given by the wind pointer line, indicating the direction from which the wind is blowing. A short barb is equal to 5 knots of wind, a long barb is equal to 10 knots of wind, and a pennant is equal to 50 knots. The weather depiction chart also provides a graphic display of IFR, VFR, and marginal VFR (MVFR) weather. Areas of IFR conditions (ceilings less than 1,000 feet and visibility less than three miles) are shown by a hatched area outlined by a smooth line. MVFR regions (ceilings 1,000 to 3,000 feet, visibility 3 to 5 miles) are shown by a nonhatched area outlined by a smooth line. Areas of VFR (no ceiling or ceiling greater than 3,000 feet and visibility greater than five miles) are not outlined. Also plotted are fronts, troughs, and squall lines from the previous hours surface analysis chart. Weather depiction charts show a modified station model that provides sky conditions in the form of total sky cover, ceiling height, weather, and obstructions to visibility, but does not include winds or pressure readings like the surface analysis chart. A bracket ( ] ) symbol to the right of the station indicates the observation was made by an automated station. Significant weather prognostic charts are available for low-level significant weather from the surface to FL 240 (24,000 feet), also referred to as the 400 mb level and high-level significant weather from FL 250 to FL 630 (25,000 to 63,000 feet). The primary concern of this discussion is the low-level significant weather prognostic chart. 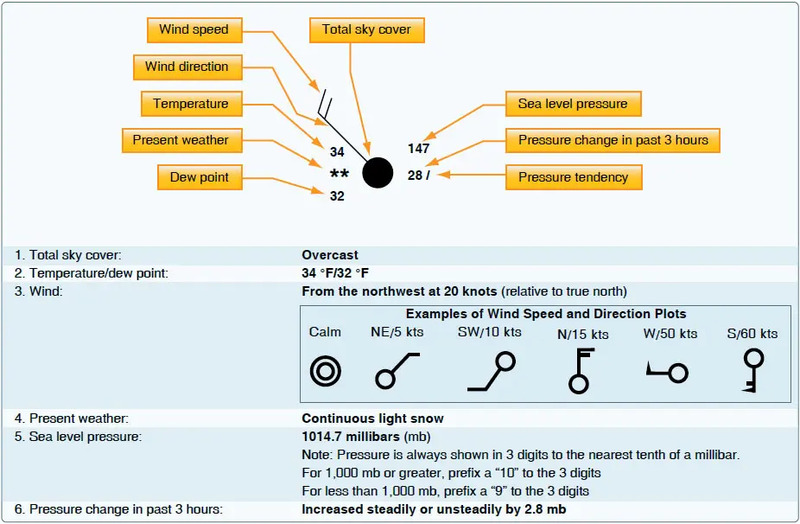 The low-level chart is is a forecast of aviation weather hazards, primarily intended to be used as a guidance product for briefing the VFR pilot. 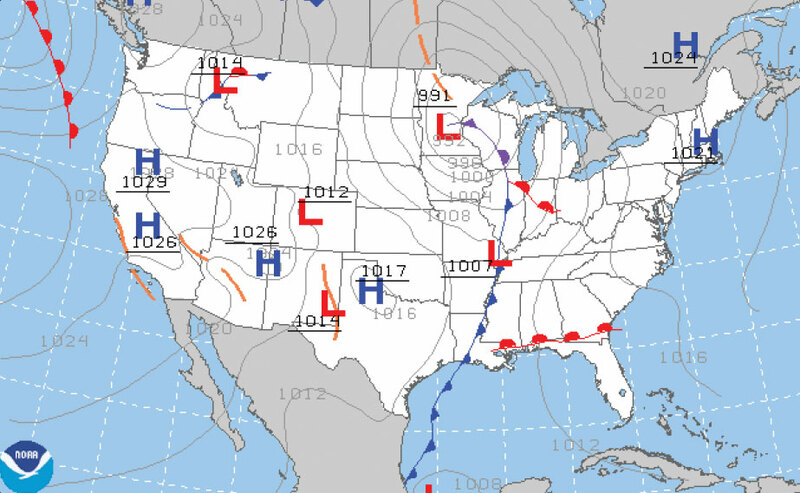 The forecast domain covers the 48 contiguous states, southern Canada and the coastal waters for altitudes below 24,000 ft. Low altitude Significant Weather charts are issued four times daily and are valid at fixed times: 0000, 0600, 1200, and 1800 UTC. Each chart is divided on the left and right into 12 and 24 hour forecast intervals (based on the current NAM model available). Effective September 1, 2015, the four-panel Low Level SFC-240 chart was replaced with a two-panel chart. The new two-panel chart will be the same as the top two panels in the former four-panel chart, depicting the freezing level and areas of IFR, MVFR, and moderate or greater turbulence. The bottom two panels of the chart have been removed. 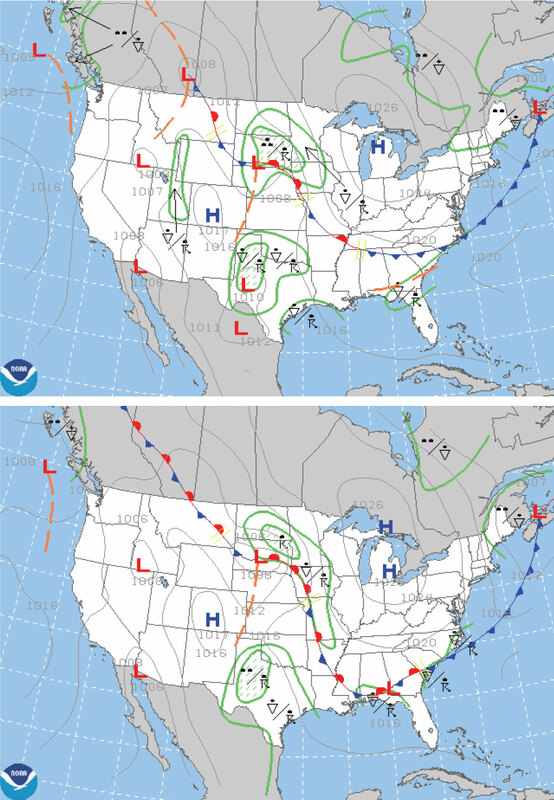 In lieu of these bottom two panels, an enhanced surface chart that includes fronts, pressure, precipitation type, precipitation intensity, and weather type, is displayed. The green precipitation polygons will be replaced by shaded precipitation areas using the National Digital Forecast Database (NDFD) weather grid. Figure 13-13 depicts the new two-panel significant weather prognostic chart, as well as the symbols typically used to depict precipitation. The two panels depict freezing levels, turbulence, and low cloud ceilings and/or restrictions to visibility (shown as contoured areas of MVFR and IFR conditions). These charts enable the pilot to pictorially evaluate existing and potential weather hazards they may encounter. Pilots can balance weather phenomena with their aircraft capability and skill set resulting in aeronautical decision-making appropriate to the flight. Prognostic charts are an excellent source of information for preflight planning; however, this chart should be viewed in light of current conditions and specific local area forecasts. The 36- and 48-hour significant weather prognostic chart is an extension of the 12- and 24-hour forecast. This chart is issued twice a day. It typically contains forecast positions and characteristics of pressure patterns, fronts, and precipitation. An example of a 36- and 48-hour surface prognostic chart is shown in Figure 13-14.